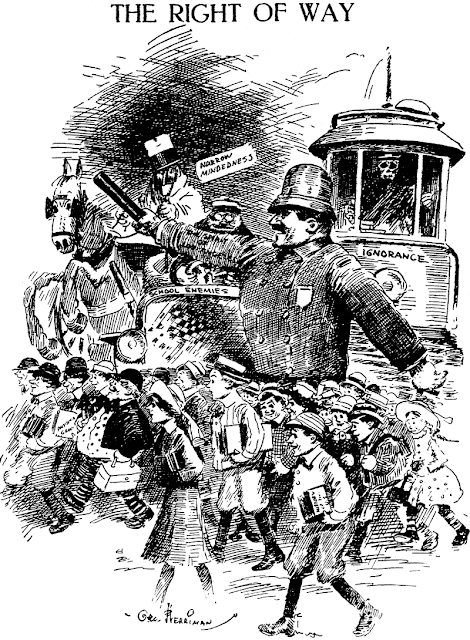 September 23 1909 -- Herriman celebrates the virtue of learning in a well-drawn editorial cartoon. This cartoon accompanied a newspaper crusade to buy a newly issued LA school bond. Here's an oddball card. 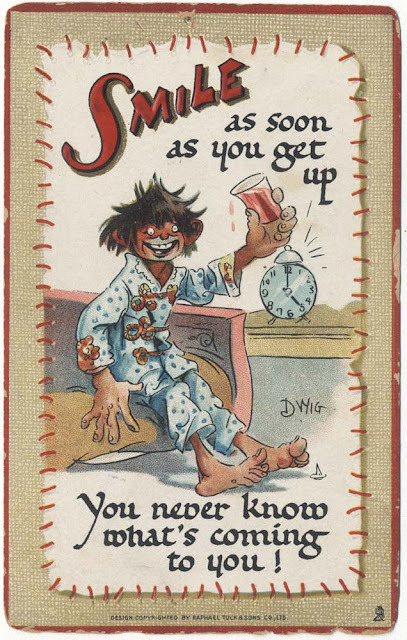 This is a card from the Tuck 'Smiles' line, Series 169. But the back of the card has an ad for Butter Crust Bread rather than the standard Tuck reverse. I guess this bread company contracted with Tuck to offer their cards, maybe in a giveaway, with their logo on the back. That's a real collectible,I've seen this happen a few times. Tuck had nothing to dow with Butter Crust, a distributor would have a pile of cards printed with the product logo. They'd just have a lot of cards printed over, maybe no two the same card. I've had them where a local politician would have a message done like this, the card face having nothing political about it. James “Jim” Orman Christiansen was born in Baldwin, New York, September 18, 1927, according to Who’s Who of Comic Strip Producers. The same birth date was found in the Lutheran Church of America, Records, 1875–1940, at Ancestry.com, which had Christiansen’s full name and baptism on December 13, 1927 at the Zion Lutheran Church in Brooklyn, New York. Christiansen and his parents, Ivar and Marie, were recorded in the 1930 U.S. Federal Census in Hempstead, Nassau County, New York, at 51 Harte Street. Christiansen’s father was a Norwegian emigrant and bricklayer. The Nassau Review-Star (Freeport, New York), December 21, 1935, published an “In Memoriam” list that said Christiansen’s mother died December 21, 1930. It’s not known when his father remarried to Charlotte Jensen. The 1940 census recorded Christiansen, his father, sister, step-mother and step-grandmother in Roosevelt, Hempstead, Nassau County, New York, at 133 East Lincoln Avenue. Christiansen’s father was an insurance agent. Christiansen’s father’s New York Guard service card said he served two years, from 1940 to 1942. The card listed two addresses: the home address was 133 Lincoln Avenue, Roosevelt, New York; and the change of address was 37 Grand Terrace, Baldwin, New York. Who’s Who of Comic Strip Producers said Christiansen studied at the School of Visual Arts. 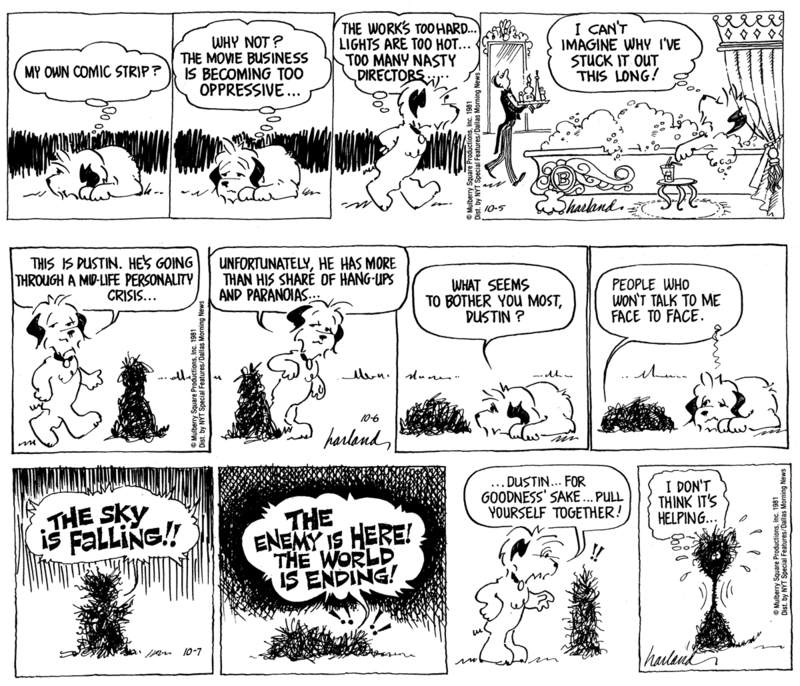 American Newspaper Comics (2012) said Christiansen was an assistant to Tom Gill who drew the strip, Flower Potts, from May 20, 1946 to July 3, 1948. Christiansen served in the Korean War. He was an army engineer according to Who’s Who of Comic Strip Producers. The Nassau Review-Star, September 18, 1952, noted the return of several local veterans including Christiansen. Troop transports brought 16 Nassau veterans of Korea combat to the U. S. West Coast yesterday. Christiansen was the third artist on Davy Crockett, Frontiersman, which began with Jim McArdle on June 20, 1955. In mid-January 1957, Jack Kirby ghosted the strip for about two-and-a-half weeks. 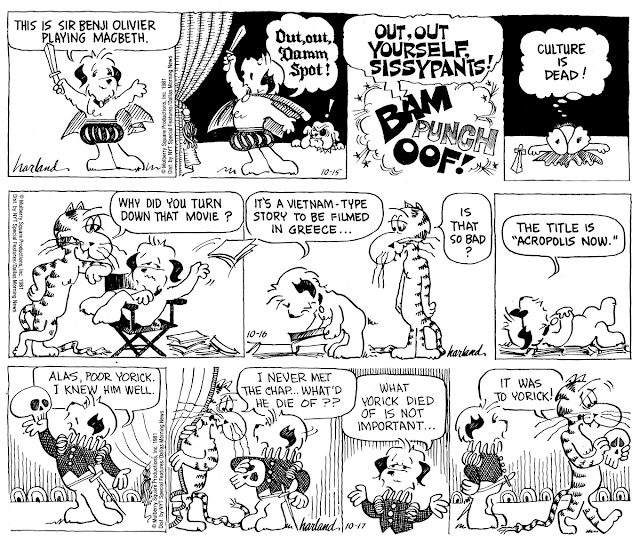 Christiansen took over the Columbia Features strip on March 10, 1957. Christiansen was the fourth artist on Nero Wolfe. Mike Roy started the strip November 26, 1956. He was followed by Pete Hoffman Fran Matera, and Christiansen, who produced the daily and Sunday from August 26, 1957 to March 1, 1958. Columbia Features was the syndicator. Christiansen worked briefly in the comic book industry. 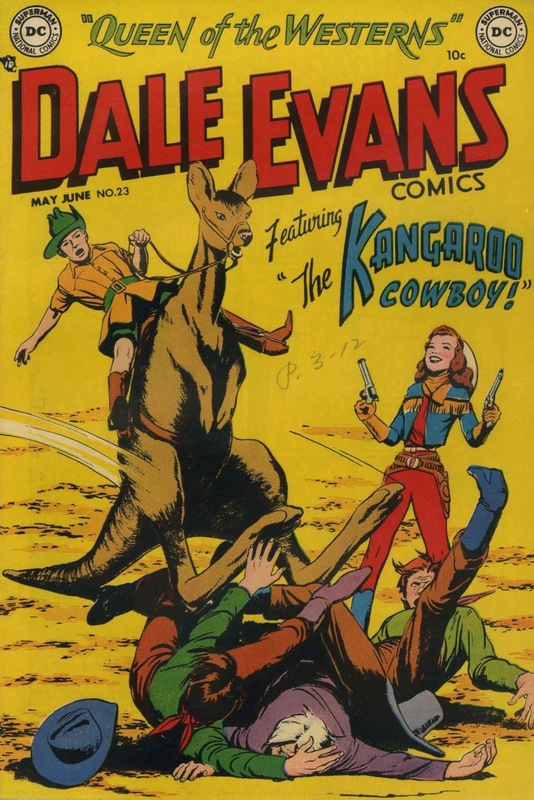 Who’s Who of American Comic Books 1928–1999 said he drew the Lone Ranger in 1955, and produced material for Treasure Chest from 1956 to 1958. Both Who’s Who said Christiansen was an assistant art director at the Robinson Tog [sic: Tag] and Label Co. The dates of his employment were not stated. Christiansen’s father passed away November 19, 1991 in Florida. Christiansen’s present status and whereabouts are not known. Jim Christiansen is alive and well at 91. I know. I'm one of his daughters. Impressive compilation up to the late 1950s of his life and work. James “Jim” Nivison McArdle was born in New York, New York, on November 22, 1899, according to the New York City birth record at Ancestry.com, his World War I draft card (which also had his full name), and Who’s Who in American Art (1959). The 1900 U.S. Federal Census recorded McArdle as the only child of James and Lillian. His father was an Irish emigrant and liquor dealer. The family resided at 425 West 52nd Street in Manhattan. According to the Field Guide to Wild American Pulp Artists, McArlde’s father died when he was five months old. The New York, New York, Marriage Index at Ancestry.com said McArdle’s mother remarried to William Smoot on April 20, 1904. According to the 1905 New York state census, McArdle and his parents lived in Manhattan at 816 Tenth Avenue. His step-father was a stevedore. The 1910 census and and 1915 state census recorded McArdle, his parents and two step-sisters at 771 Washington Street in Manhattan. In 1915, McArdle was an office boy. On September 12, 1918, McArdle signed his World War I draft card. His address was 52 Jane Street in Manhattan. McArdle was a clerk with the Brooklyn Eastern District Terminal in its office at 129 Front Street in Manhattan. His description was medium height, slender build with blue eyes and dark brown hair. In the 1920 census, McArdle was counted in the Smoot household which numbered seven. The family resided in Manhattan at 159 Ninth Avenue. McArdle was a clerk at a men’s furnishing store. The New York, New York, Marriage Index recorded McArdle’s marriage to Lillian D. Larkin in Manhattan on June 14, 1924. Who’s Who in American Art said McArdle studied at Fordham University. According to Who’s Who of American Comic Books 1928–1999, McArdle studied art at the Academy of Design and Art Students League. McArdle was a self-employed commercial artist according to the 1930 census. He and his wife made their home in Brooklyn at 36 Crooke Avenue. The New York Times, February 10, 1960, said McArdle was a magazine and fashion illustrator, and a member of the Society of Illustrators. McArdle signed his name as “Jay McArdle”. From New York City, the couple went on a cruise from February 25 to March 13, 1931 on the steamship Britannic. The passenger list had the same address as the census. In the 1940 census, the couple lived in Manhattan at 35 East 30th Street. McArdle was a freelance commercial artist and his wife was an artist. The census said McArdle had completed three years of high school. The Nassau Daily Review-Star (New York), October 3, 1942, reported McArdle’s divorce. Mrs. Lillian L. McArdle of South Oyster Bay road, Hicksville, won a divorce from James N. McArdle who now lives at 225 East 79th street, Manhattan. They were married in 1924. There were no children and she asked no alimony. She alleged that McArdle was living with another woman at the Manhattan address. A family tree at Ancestry.com said McArdle’s second wife was Gladys May Brown, an Irish emigrant. 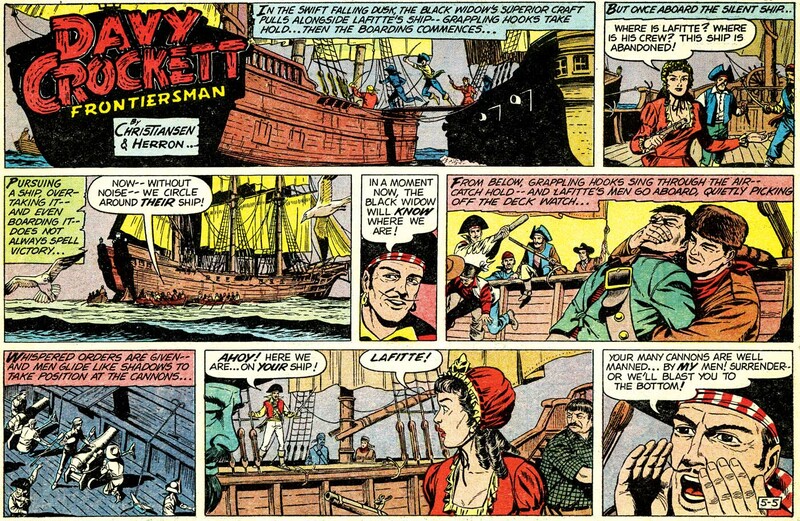 McArdle worked for several comic book publishers in the 1940s and 1950s. An overview of this work is at Who’s Who of American Comic Books. 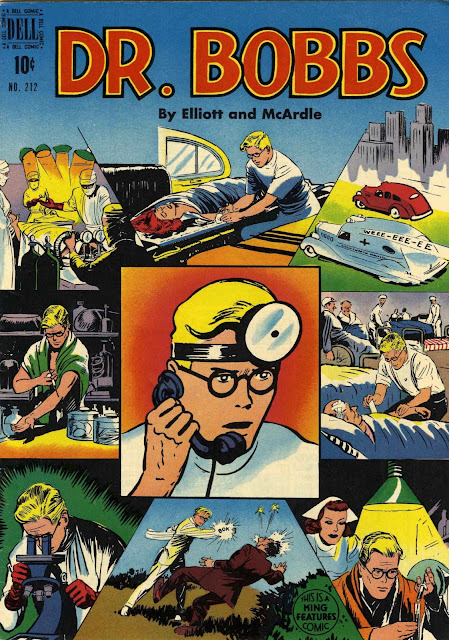 American Newspaper Comics (2012) said McArdle (as “Jim McArdle) drew and Elliot Caplin wrote Dr. Bobbs from June 30, 1941 to February 18, 1950. The strip was syndicated by King Features. McArdle drew Davy Crockett, Frontiersman starting June 20, 1955. Ed Herron did the scripting starting July 18, 1955. The strip was listed in the Catalog of Copyright Entries, Third Series, July–December 1955. McArdle’s run ended in January 1957. 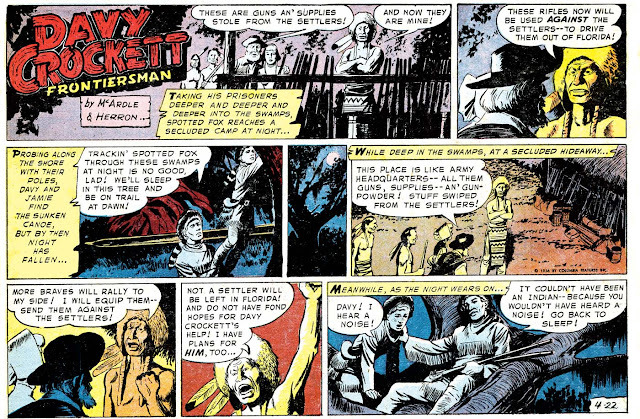 Jean Depelley, with Bernard Joubert, wrote about Jack Kirby ghosting the Davy Crockett strip at The Kirby Effect. American Newspaper Comics said Kirby did two Sundays, February 24 and March 3, 1957. 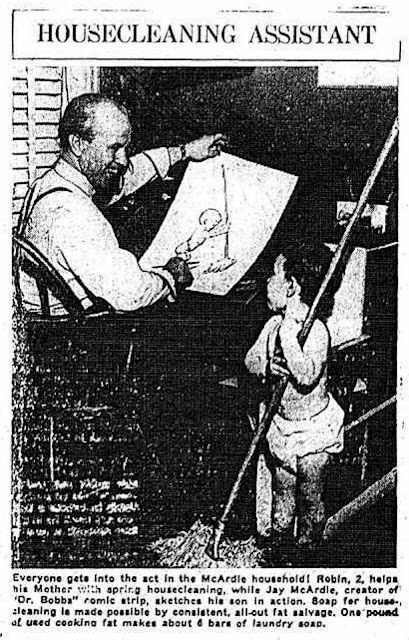 After Kirby’s brief stint, Jim Christiansen continued drawing the daily and Sunday for Columbia Features. Who’s Who in American Art said McArdle was a member of the National Cartoonists Society. McArdle passed away February 7, 1960, at his home, 1356 Madison Avenue, in New York City. His death reported in the Times which said he was survived by his wife, two sons, three half-sisters and a half-brother. When Walt Disney decided to tag along with the boom in TV westerns with a mini-series about Davy Crockett for his Disneyland show in 1954, he unleashed an unexpected mania among the pre-teen boy set. Coonskin caps, fringed jackets and leather moccasins became a full-fledged marketing bonanza, and the theme song of the program became a #1 hit. Columbia Features recognized a golden opportunity. Disney had made the mistake of making a pop culture phenomenon out of an historical figure. You can't copyright and trademark a real person, so Columbia was within its rights to offer a comic strip about Crockett, piggy-backing on the craze. The Columbia Features strip, titled Davy Crockett, Frontiersman, debuted as a daily on June 20 1955* to a lukewarm reception from newspaper editors, a victim of the fact that there were already so many western strips already on the market. Editors were doubtlessly saying that sure, Crockett is a hot property, but am I supposed to turn over the whole blamed comics page to cowboys and their ilk? 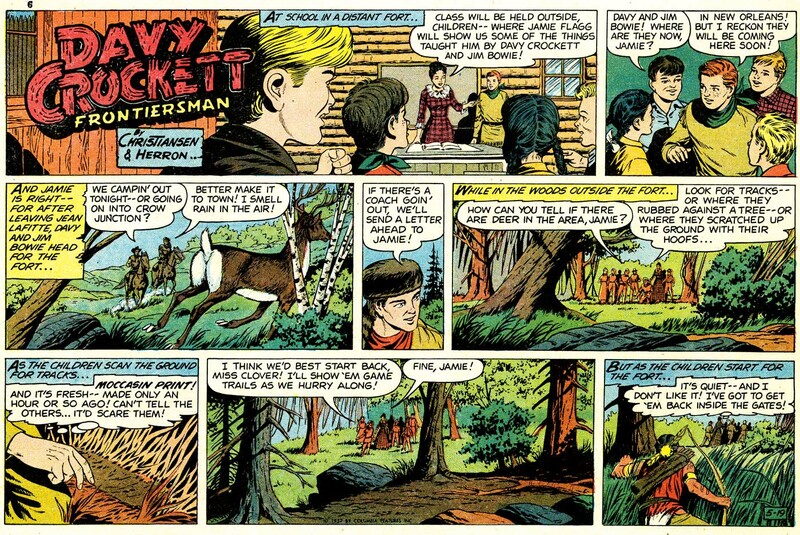 There was also the factor that papers running Disney's Treasury of Classic Tales series (and there were a lot of them) had been put on notice that they were going to do the 'real' Disney version of Davy Crockett in a six month Sunday strip series starting in July. 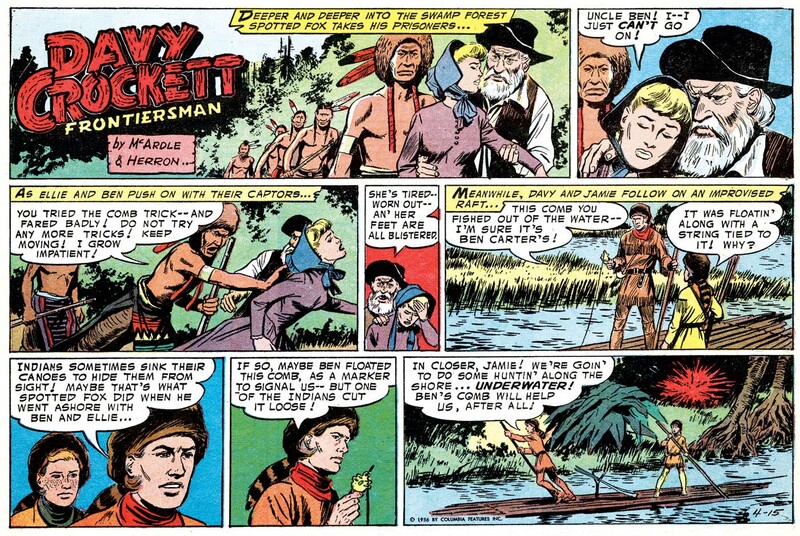 Columbia's new strip was created by Jim McArdle, a journeyman artist who spent nearly the whole decade of the 1940s drawing the adventures of Dr. Bobbs (an obscurity that we'll discuss here one of these days). McArdle's art was nothing to write home about, but it got the job done. Never known as a writer, McArdle was soon joined on the strip by Ed Herron, who took over scripting duties on July 18 1955**. Despite the appearance of the Disney version in Sunday papers, Columbia decided to go head to head with their own color version, which debuted on October 16 1955***. Although it never appeared in many papers, the Sunday got a few plum sign-ups, from the Chicago Tribune and New York Daily News, which alone can keep a strip afloat. 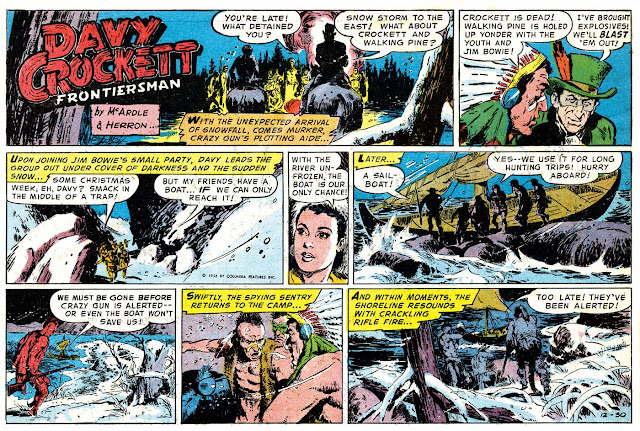 The Columbia strip told the sort of non-historical but semi-plausible baloney that you would expect, expanding even more on Disney's truth-in-advertising Legend of Davy Crockett -- accent on the Legend part. Then in January the King weighs in. And by the King, of course I mean Jack Kirby. Working under McArdle's signature, Kirby drew the dailies for January 14 to February 2****, and the Sundays of February 24 and March 3, before giving way to the new regular artist, Jim Christiansen. If you'd like to see the Kirby Sundays, you'll find them here on Michael Vassallo's blog. I think Christiansen's art is a real breath of fresh air, but it was too little too late for the strip. As far as I know by the time he came on board there might well have been only a single client left -- the New York Daily News. And when they told the syndicate that they were dropping the strip in favor of The Heart of Juliet Jones, Columbia knew they were sunk. The final Sunday appeared on August 25 1957, followed by a week of dailies to finish off the last story, ending on the 31st****. Columbia continued advertising all of their strips for many years in Editor & Publisher, but there was no new material created, nor were there any takers that I know of for reprinting the existing material. * Sources: Chronology of American Comic Strips, Cleveland News. **** Source: New York Daily News. Animal lover and television director/producer Joe Camp decided in the early 1970s to combine his two passions. He tried to sell Hollywood on the idea of a family-friendly movie about a scruffy little dog and had every door slammed on him. Not to be denied, Camp rounded up his own financing and shot the film Benji on a shoestring. The movie became a monster hit, grossing $45 million, and that scruffy mutt became a star. 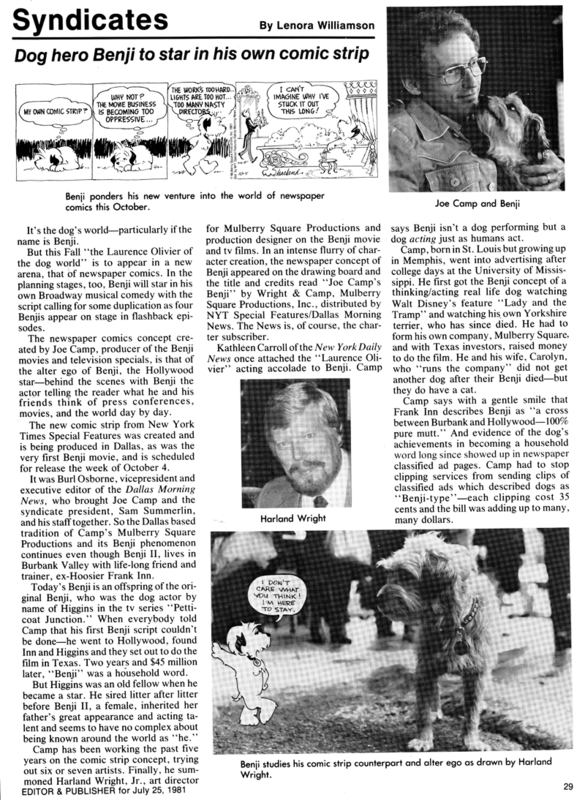 More successful movies and TV appearances ensued, and in 1981 Camp was approached about the possibility of a Benji newspaper comic strip. 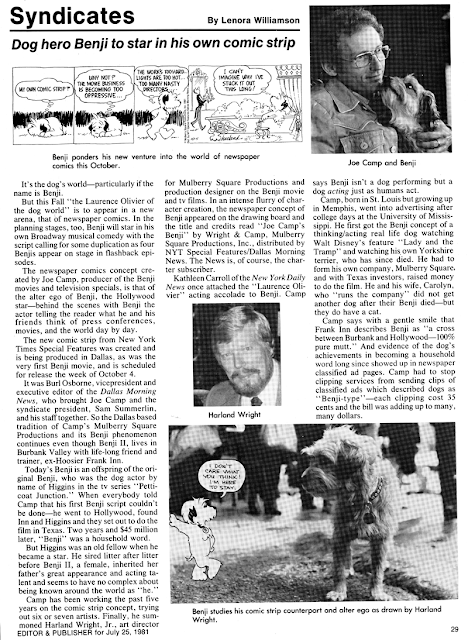 The realization of the strip took three companies -- Camp's own Mulberry Square Productions, the Dallas Morning News (the publisher lived next door to Camp), and New York Times Special Features. The Times had recently dipped a toe into the comic strip syndication world with very modest success, and Benji was destined to be the final feature introduced by them. Harland Wright, art director at Mulberry Square Productions, was chosen to handle the art on the strip, with Camp writing the gags himself. Wright was a capable cartoonist, but his sense of character design was a bit bizarre. Benji himself looks okay, but his co-stars are straight out of a freak show. Dustin the dog is drawn as a collection of random squiggles, and Clawd is a cat with a monstrous growth on his face (is it a nose? a fat lip? elephantitis? who knows). 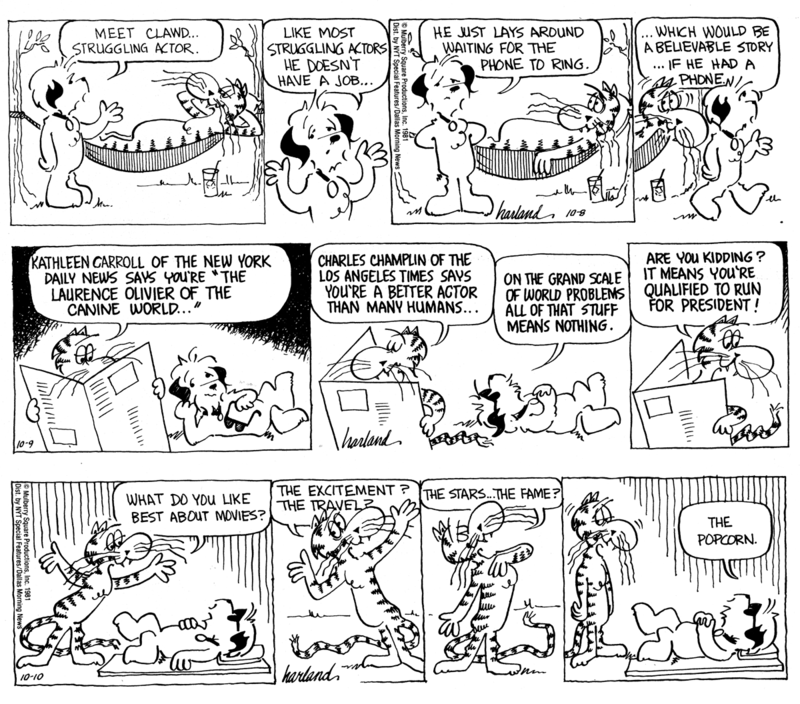 The daily-only strip debuted on October 5 1981 in a very small number of papers (perhaps less than fifteen), but Camp was no stranger to swimming against the tide, so the strip soldiered forth. Harland Wright was apparently never intended to be the permanant artist on the strip, and he bowed out not long after the debut. A new artist was found, an art student at North Texas State University named Casey Shaw, and he was groomed to take over the art. He began drawing the strip on November 2 1981. Wright continued to oversee and sign the art until December 19. Thereafter the strip was unsigned for the rest of its year-and-a-half run. That's a tricky one. I was a college kid just happy to be working on a syndicated comic strip and Benji was such a creation of Joe Camp that I was kind of surprised that Harland ever got to sign it. I equated it to working on a strip for Disney, which the artists never seemed to sign. If they had offered, I'm sure I would have accepted just for the opportunity to have my name become more a part of the comics community, but I never pushed or lobbied for it. One of my most treasured possessions is a letter from Berke Breathed excoriating me for not signing the Benji work. This was during the time period after Breathed had graduated from the Univ. of Texas, but right before the launch of Bloom County. Breathed had been drawing Academia Waltz at UT while I was a high school student in San Antonio and the paperback collections of his college work had inspired me to start a daily strip at North Texas State when I went there (which is what eventually led to the Benji gig). I had sent Breathed some samples of my college work and corresponded a couple of times and then sent him a few of the Benji clips. His response to my working part-time illustrating someone else's strip with no credit was written in that exquisite exuberant exasperated style that we all came to know from Breathed. After Benji ended, I went on to full-time graphic design and computer graphics work, but I always continued to also spend at least part of my time doing cartooning work. While in Dallas, I freelanced humorous illustration for numerous companies and contributed regularly to the Dallas Observer alternative weekly newspaper. I later moved on to USA Today and became Creative Director for their USA Weekend Magazine Sunday newspaper supplement. During that time, I was also the magazine's cartoon and puzzle editor and I drew weekly gag cartoons for the magazine's Wit & Wisdom column. These days, I'm doing less cartooning and more gallery fine art work, though I also still work full-time as a designer for the local newspaper, which is owned by Berkshire-Hathaway Media Group, and one of my jobs is building the newspaper's comics pages. When I was a kid, the thing I dreamed of most was becoming a syndicated newspaper comic strip cartoonist ... and now I fear, with the direction newspapers are taking, that it may actually be possible that a generation from now, kids will have no idea what newspaper comic strips were! My dad instilled a real love of the art form in me and I used to spend hours in the library pouring through old newspaper archives and micro-fiche in amazement at the work created in the early 20th century. Thanks very much to Casey Shaw for his invaluable help with this mini-history of the Benji strip. There it is! Casey Shaw's name seemed familiar, and then the mention of USA Weekend brought it back. 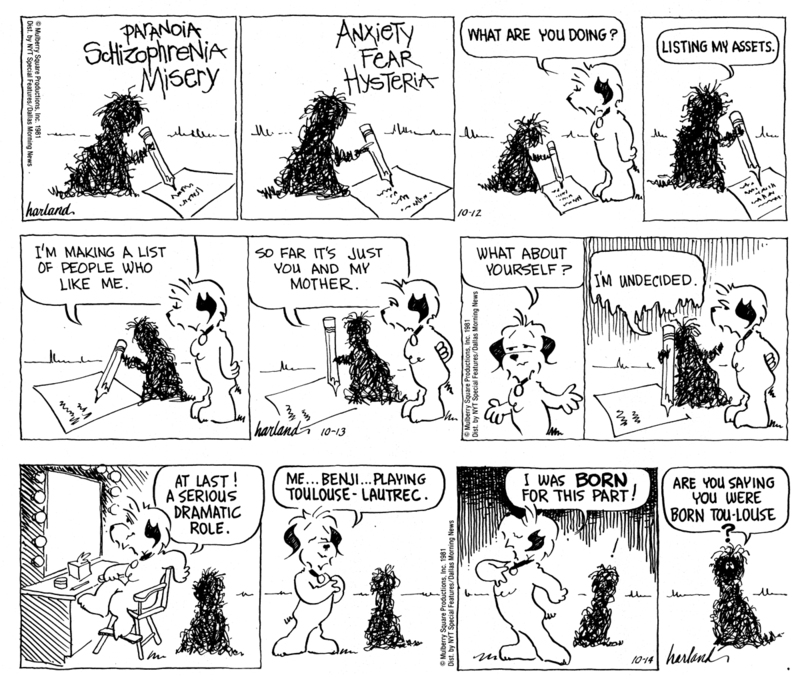 His cartoons appeared there regularly for at least the last ten years of the insert's existence. "Casey's Cartoon Corner" had a very short run, but I remember enjoying Casey's cartoons every weekend for quite awhile.